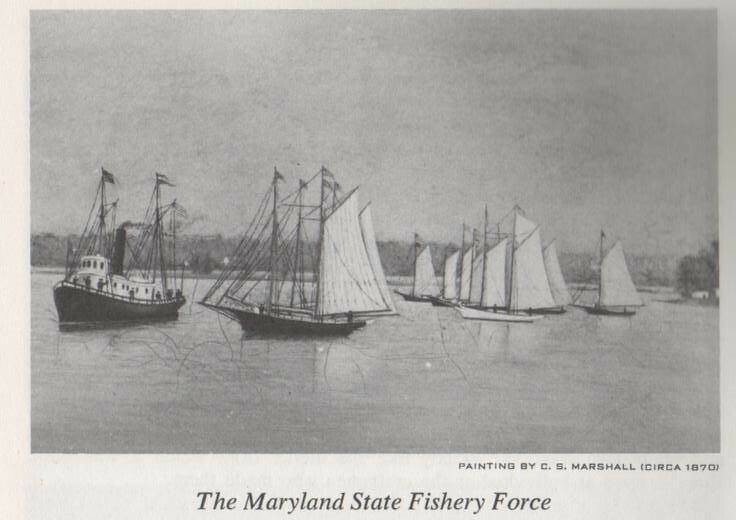 This year, the Maryland Natural Resources Police is celebrating its 150th anniversary, a milestone that makes it the fourth-oldest state conservation law enforcement agency in the nation. Then as now, the mission is to protect the state’s most precious resources, its citizens and visitors. Back in 1868, the General Assembly created the “State Oyster Police Force” to tame the pirate ships from out of state and locally that were plundering Chesapeake Bay oyster bars and sending the bounty to northern cities. Lawlessness was rampant. The bodies of unfortunate watermen who ran afoul of the outlaws often were found floating offshore. Fierce gun battles made the headlines of major newspapers in New York and beyond. In 1874, state lawmakers created the State Fishery Force to protect all aquatic species and in 1896, the Office of the State Game Warden was established to extend protection to wildlife. Passage of the 1960 State Boating Act added enforcement duties to officers’ jobs. Eleven years later, the state recognized the importance of a unified effort and consolidated enforcement activities into a single unit: the Natural Resources Police. Today, the Maryland Natural Resources Police protects 480,000 acres of public land and 17,000 miles of waterway, serves as the state’s lead agency for maritime homeland security and teaches thousands of people each year how to hunt and boat safely. On display below is a sampling of various badges worn throughout the years. An accompanying timeline follows, highlighting some of the most significant events of an ever-evolving force. The State Oyster Police Force, nicknamed the “Oyster Navy,” is created by the General Assembly. Patrol boats capture six illegal dredgers in the Wicomico River on the Eastern Shore. A justice of the peace fines each poacher $50, the first record of penalties secured by the Oyster Navy. The patrol vessel, Mary Compton, is fired upon by oyster pirates on the Annemessex River in Somerset County. The crew returns fire with a deck-mounted howitzer, sinking the pirates’ boat. During that year, the Oyster Navy arrests more than 130 poachers and collects more than $7,300 in fines. In a story that captures headlines in New York and beyond, the Oyster Navy goes toe-to-toe with poachers on the Chester River after they mistakenly fire on a passenger steamer. The patrol boat, Governor McLane, is ambushed by a flotilla of ships and resorts to ramming and sinking two ships with its iron bow. The McLane’s crew captures 24 prisoners, but several other pirates escape. Capt. Josiah Bromwell, 45, a mate aboard the police schooner Julia Hamilton, drowns on the Little Choptank River in Dorchester County when he is swept overboard in rough waters. The Cambridge newspaper reported on the tragedy in its Sept. 23 edition, the earliest documentation of an on-duty death of a Maryland conservation officer. 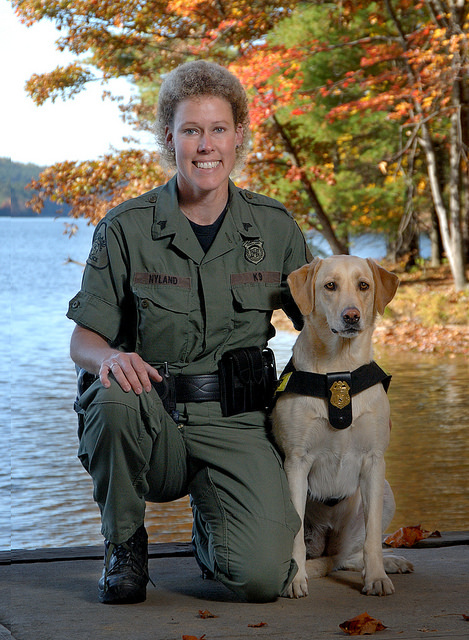 The Office of Game Warden is created by the General Assembly to extend protection to wildlife. 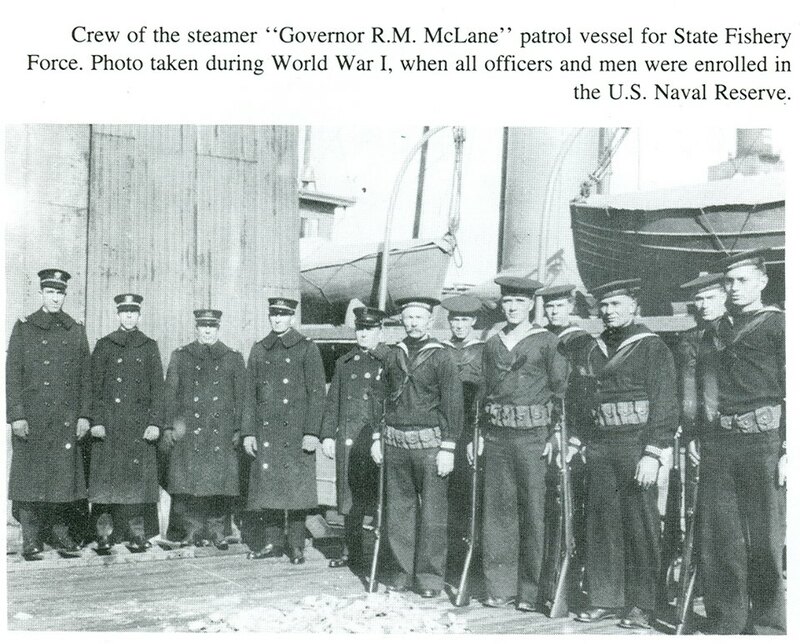 All vessels of the State Fishery Force are made part of the U.S. Navy and officers are assigned to the Naval Reserve as part of the preparations for World War I. Their mission is to guard against an enemy invasion and protect shipping. Officers and vessels return to state in late 1918. Prohibition begins and the State Fishery Force assists federal revenue agents intercepting rumrunners in the Chesapeake Bay and its tributaries. Uniforms are issued to game wardens for the first time. 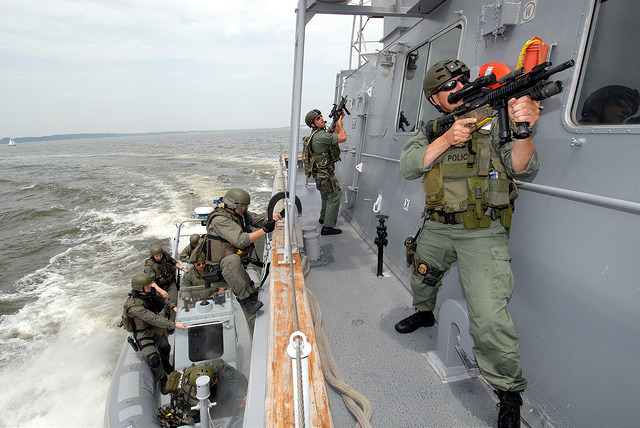 Patrol boats are armed with deck-mounted machine guns. They are removed after World War II. Patrol boats are outfitted with police radios. Deputy Game Warden Gordon G. Barnes is shot to death by a man during the closed hunting season in Worcester County. The suspect, connected with an earlier shooting, is convicted and hanged in the Maryland Penitentiary. Barnes, 39, leaves a wife and young son. The first airplane, a two-seater, is purchased by the agency. A small helicopter is added in 1964. Inspector William Schriver, 29, is thrown from his patrol vessel as he starts it and drowns in the Patuxent River. His boat and body are discovered on the riverbank near his Solomons home. The Maryland State Marine Police Academy begins its first class on Kent Island with a class of eight officers. District Game Warden Charles W. Rider is on patrol on U.S. 50 in Grasonville, when he swerves to avoid an oncoming vehicle in the wrong lane. Rider, 38, is killed but his quick action saves his partner. A dive team is created to assist in vessel and body recoveries, search for criminal evidence and aid first-responders to accident scenes. District Inspector George T. Mullikin, a 44-year-old member of the dive team, suffers a fatal heart attack as he attempts to free an anchor on a research vessel in the Choptank River. Officer Leo Friend, who patrols Garrett County, dies from a bacterial infection contracted while inspecting fur dealers, taxidermists and rabbit breeders during the winter of 1970. A street in his home county is named for the World War II veteran. The Marine Police and the Wildlife Law Enforcement Division are consolidated by an act of the General Assembly into the modern Natural Resources Police. Ranger Joe Carr dies in the line of duty while assisting another ranger with a drug arrest at Patapsco Valley State Park. Carr, 64, suffers a massive heart attack while subduing the suspect and cannot be revived. 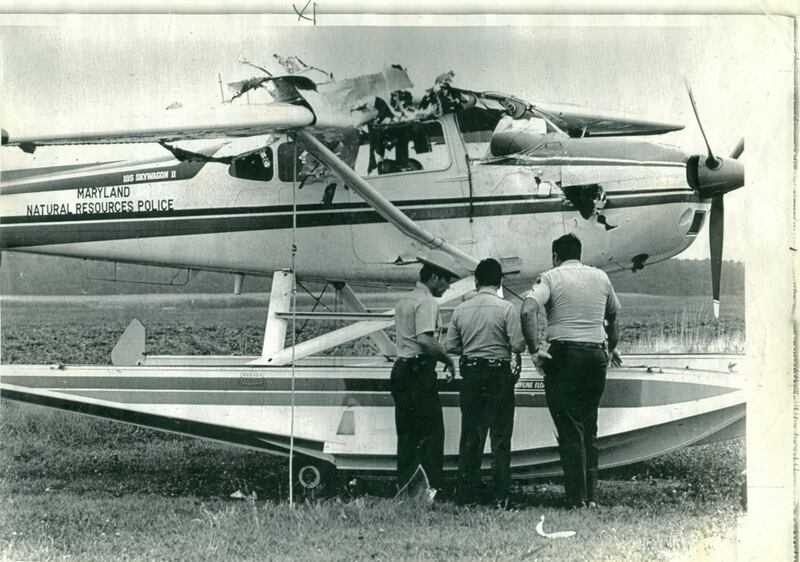 A powerful bomb destroys the Natural Resources Police seaplane as it sits at an airstrip on Kent Island. The case remains unsolved, but the Federal Bureau of Investigation suspect it is the work of poachers or drug dealers under surveillance at the time. After Air Florida 90 crashes into the Potomac River during near-blizzard conditions during takeoff from National Airport, dive team members rush to the scene to join search-and-recovery efforts that last for weeks. Officers are called on to enforce Maryland’s controversial moratorium on striped bass fishing to conserve a dwindling stock. The penalties: a $1,000 fine, a year in jail and confiscation of their equipment. Other Atlantic states follow. The moratorium lasts through 1990. In a tragedy that rivets the public nationwide, Gian Coppola, son of filmmaker Francis Ford Coppola, dies of massive head injuries in a freak boating accident on the South River in Annapolis. Investigators say Griffin O’Neal, the operator of the 14-foot boat and son of actor Ryan O’Neal, cuts between two boats with a tow line between them, which clotheslines Coppola. O’Neal’s conviction on negligence charges spurs state lawmakers to enact what are the toughest boating safety laws in the nation. A Memorial Day weekend boating accident in Ocean City kills four people in the state’s worst maritime accident in modern times. Investigators determine that a 19-foot speedboat with seven people aboard crashed into the front of a 25-foot speedboat drifting with its engine off. None of the passengers are wearing a life jacket. With donations from local business and a dog donated by a local animal shelter, Cpl. Lisa Nyland re-establishes the K-9 unit. The first dog, Jesse, later makes headlines by finding a baby, a lost Boy Scout and working a six-day shift at the Pentagon after the 9/11 terrorist attacks. Plans are announced to create a volunteer reserve officer program. 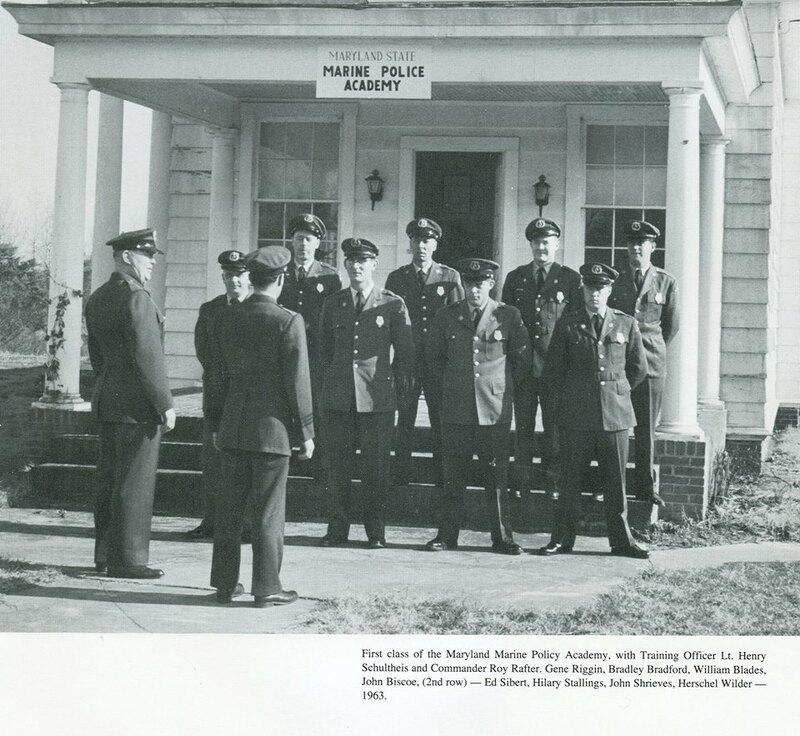 The first Citizens’ Academy begins in January 1997 and newly trained reserve officers are in the field by spring. After an 18-month investigation, officers break up a St. Mary’s County deer poaching ring involving hunters and unlicensed taxidermists that took nearly 100 trophy bucks. The cases resulted in more than $13,000 in fines and additional court-ordered restitution. Col. Douglas DeLeaver, chief of the Maryland Transit Administration police force, is appointed superintendent, the first African American to lead the agency. The appointment marks DeLeaver’s return to the Natural Resources Police, where he served for nearly five years as a captain and then major. Lt. Col. Tammy Broll, a 25-year veteran commander, is named acting superintendent, the first woman to run the agency. The 25-year veteran and leader of the field forces serves in the role for five months until a permanent replacement is named. More than 150 Natural Resources Police officers and 91 Maryland Park Service rangers take the oath of office together at a ceremony at Chesapeake College to signal the consolidation of the two law enforcement units. The Tactical Response Team is created to locate lost hikers and hunters, and apprehend criminal suspects. Early on, the team makes headlines by finding a toddler standing at the edge of a stream in Harford County, an 82-year-old Alzheimer’s patient missing for two days in Wicomico County and a 7-year-old boy who got lost in 14-degree weather while trying to find his dog. The team’s duties also include maritime homeland security to help protect the Chesapeake Bay, Port of Baltimore and other waterfront infrastructure. The largest striped bass poaching ring in the history of the Chesapeake Bay and Potomac River is broken up by Maryland, Virginia and federal conservation law enforcement agencies. The bust, after a five-year undercover investigation, captures headlines and changes the way commercial fishing activity is monitored along the Eastern Seaboard. A prominent Washington fish market is closed, executives of two wholesalers and seven watermen are found guilty. A judge hands down federal prison sentences and fines of more than $1.36 million. The agency begins rolling out the Maritime Law Enforcement Information Network, a system of radar units and cameras on the Chesapeake Bay to track commercial traffic going into the Port of Baltimore, assist officers protecting oyster sanctuaries and provide real-time information to first-responders. Officers begin hauling up miles of illegally set gill nets off Kent Island. Over the next several weeks, more nets are discovered, the commercial striped bass season is halted and the General Assembly gives fisheries regulators more authority. Four Eastern Shore watermen are arrested for illegally catching more than 10 tons of striped bass. A federal judge sentences the poachers to prison, orders fines of more than $100,000 and restitution to the state exceeding $500,000. A class of three K-9s and their handlers graduate from the first in-house training academy. Harbor, Rider and Ruckus—donations from county animal shelters—join Beacon and Badger to provide statewide coverage. The dogs find missing people, illegally harvested wildlife, evidence and human remains. Natural 1, the agency helicopter, returns to the air after a seven-year absence. Since then, it has flown nearly 300 law enforcement and search-and-rescue missions, quickly going where vehicles and vessels cannot. 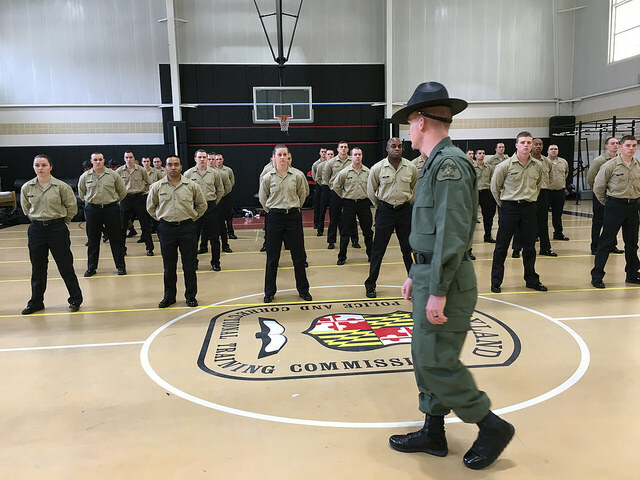 The agency launches Basic Recruit Class 59, at 35 members, the largest-ever group of trainees. Graduation is scheduled for Nov. 3. 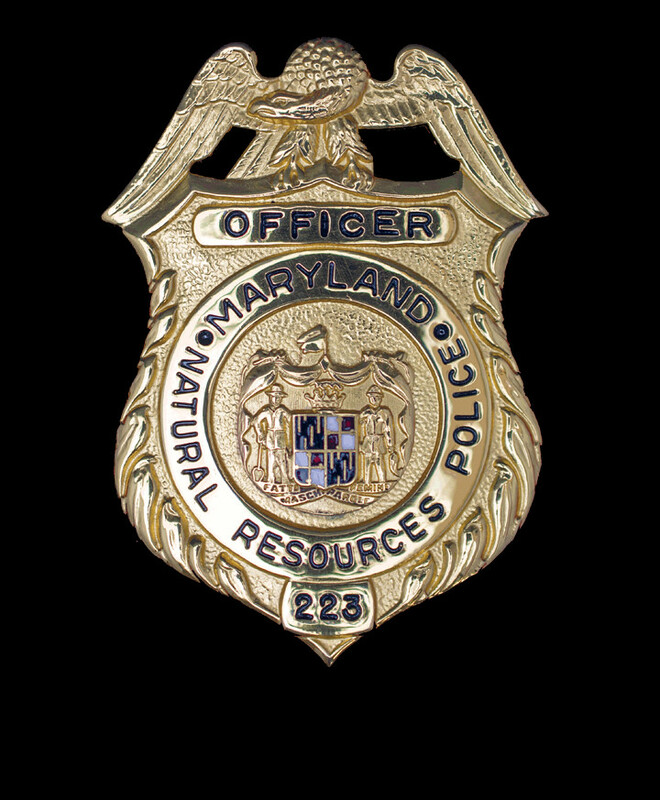 Governor Larry Hogan issues a 150th anniversary proclamation, recognizing Natural Resources Police as “Maryland’s First” police force and a national pioneer in conservation law enforcement. 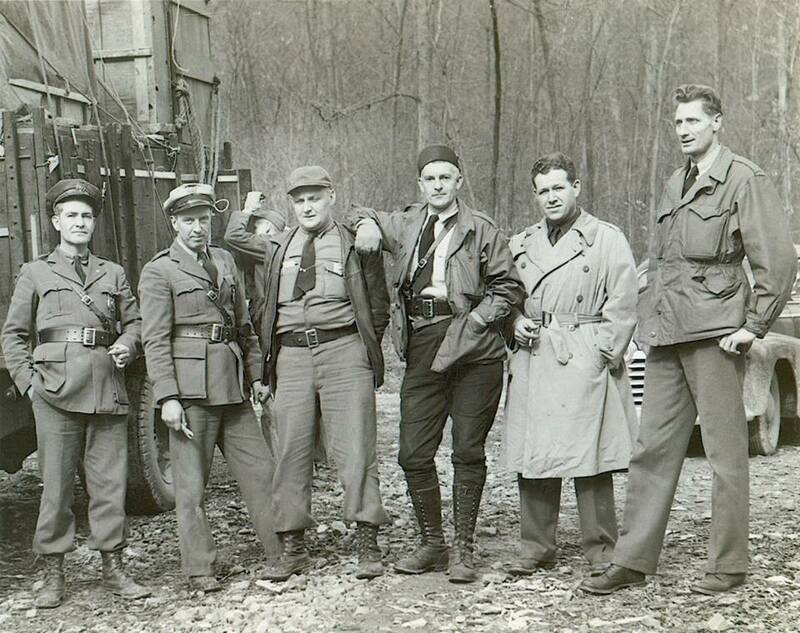 Additional historic photos will be posted throughout the year here. Article by Candy Thomson—Natural Resources Police public information officer. Appears in Vol. 21, No. 2 of the Maryland Natural Resource magazine, spring 2018.